Welcome to Puerto Vallarta’s best kept secret! This unique Mexican luxury villa is located on the beach in the exclusive lower Conchas Chinas residential neighborhood. Our Colonial style Mexican hacienda has all the elegant features one would expect from an exquisite villa vacation rental. The large doors and windows open wide onto expansive views of the beach, the blue Pacific Ocean and a lush tropical jungle. Casa Carole is conveniently located just below the main coastal road, and only five minutes from the heart of downtown Puerto Vallarta. 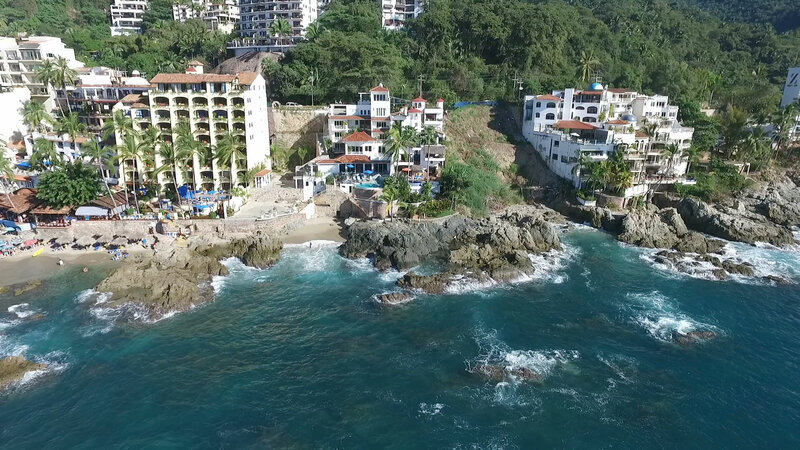 Surprisingly affordable, we pride ourselves on being the best beachfront value in Puerto Vallarta. Rental rates for this luxury villa are for 4 or 5 bedrooms, depending on the size of the group. Built on 4 levels cascading down a spectacular hillside, each bedroom suite is on a different level for maximum privacy. The spacious 6,500 square foot floor plan provides plenty of room for private reflection as well as family fun. There is direct access to a secluded sandy beach, with great snorkeling right offshore among the volcanic rocks that are home to hundreds of exotic fish. Our outstanding staff of 4, including chef, English-speaking houseman/concierge, housekeeper, and pool man, are ready to meet your every need at this luxury vacation home. The best of Mexican decor and fine design echo throughout this family-oriented vacation rental villa, providing tranquility and relaxation you won’t find anywhere else. Casa Carole’s professional support staff is second to none and you will be pampered and protected, refreshed and renewed during your stay at this once in a lifetime property.